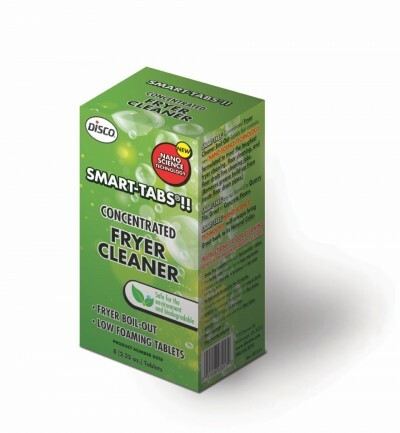 Smart-Tabs® Concentrated Fryer Cleaner boil-out tablets contain new nano-science technology formulated to meet the toughest fryer cleaning jobs. Traditional fryer boil-out products clean the inside surface of the fryer so that it appears “clean” to the naked eye. Stainless steel is not perfectly smooth, it has microscopic grooves which trap shortening and other debris, even after a traditional boil-out. When heated, this residue combines with fresh shortening and can shorten its life. Smart-Tabs!! use nano-technology to deep clean and avoid this problem. The nano-particles are small enough to deliver the cleaning agent into the microscopic grooves, thus ensuring a fully cleaned surface.